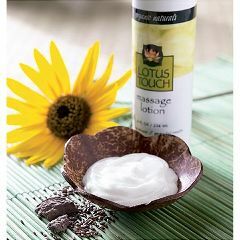 A blend of nourishing, certified organic seed oils that create a lotion with high glide and low friction. Flax seed and olive oils feature vital essential fatty acids, jojoba oil penetrates the dermis for lasting moisture and shea butter provides a silky glide and finish. This elegant product is completely absorbed by the skin leaving it silky smooth. It is water dispersible and contains no nut oils, parabens or glycols. Available in 8oz squeeze bottle, 1/2 gal and 1 gal container. Organic Flax Seed Oil - Contains appreciable amounts of essential fatty acids which are vital for healthy skin. Organic Jojoba Oil - Light, highly penetrative oil. Good for all skin types. Non-comedogenic. Organic Olive Oil - A moisturizing oil that is high in essential fatty acids. Organic Shea Butter - Excellent for soothing, protecting and moisturizing the skin. Has properties known to regenerate cells and capillary circulation. Under normal room conditions the shelf life is estimated at 2 years minimum.